The Interaction History data set stores customer interactions with decision results. It usually contains a high volume of data and requires an additional mechanism to optimize the retrieval and reading of records from the Interaction History table. 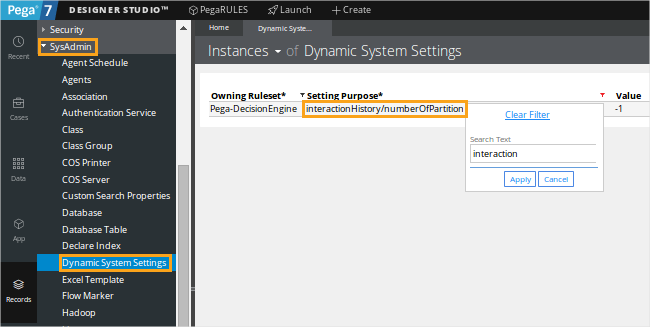 To distribute operations on the Interaction History data set across the Pega 7 Platform nodes, you can use the pyPartitioningKey property. The values for this property are computed based on the configuration of the interactionHistory/numberOfPartition Dynamic System Setting. When you change the value of this Dynamic System Setting to a positive integer, you define the number of partition keys and partitions that will be generated for new incoming interaction records. The key determines the Interaction History partition where a specific interaction should be stored. By default, the interactionHistory/numberOfPartition Dynamic System Setting is set to -1 and the pyPartitionKey property is NULL, which means that no partitions are created. You can modify this setting based on the volume of Interaction History. Pegasystems recommends that you set this to a number that is equal to twice the number of available virtual CPUs. For example, if the number of virtual CPUs is eight, configure the number of partitions to be 16. The partition key values are not related to the physical partitioning of the Interaction History table, and the existing interaction records are not changed when you modify the interactionHistory/numberOfPartition Dynamic System Setting.